Darren Turner (Beechdean Aston), Marco Sorensen (TF Sport Aston) and Yelmer Buurman (ERC Mercedes) were the early pacesetters in the second British GT free-practice session of Saturday at Brands Hatch, setting a 1:26.104, 1:26.408 and 1:26.450 respectively before handing over to their respective. The Pros got back into the cars as the session entered its final 15 minutes, Marco Sorensen putting the #17 TF Sport Aston fastest on a 1:25.552 just before the first red flag of the session came out for the #26 Aston of Matt Manderson, which hit the barrier at Paddock Hill Bend. The Ultimate Speed Team subsequently confirmed the car would take no further part in the weekend. Race control elected not to restart the session with only a few minutes remaining, so Sorensen’s 1:25.552 would stand as the fastest time, ahead of Turner’s 1:26.104. Callum Macleod had got the #7 Team Parker Bentley up to third-fastest before running ended, with a time of 1:26.251. In GT4, the early pacesetters Matt Nicoll-Jones (Academy Motorsport Aston Martin), Scott Malvern (Team Parker Mercedes) and Jan Jonck (Academy Motorsport Aston Martin), clocking 1:33.915, 1:34.047 and 1:34.316 respectively. 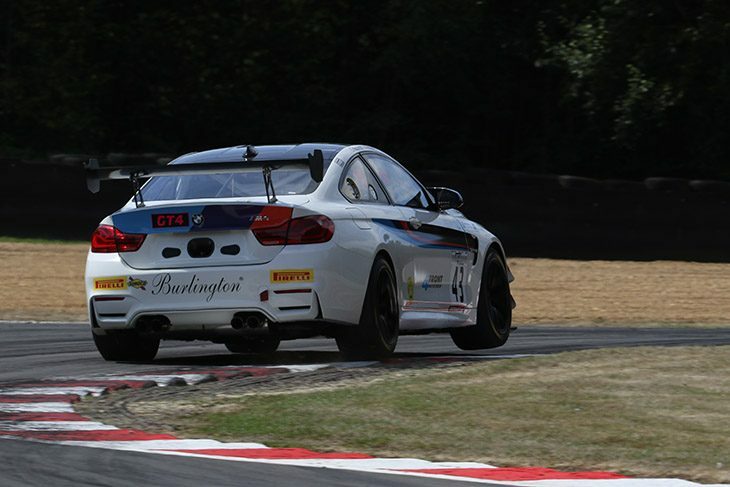 As the session unfolded, these times were bettered by the Century BMW duo of Jack Mitchell and Ben Green, who put the #42 and #43 M4s first and second with a 1:33.538 and 1:33.691 respectively. Jonck improved his earlier time to 1:33.915, but remained third-fastest in the class. Elsewhere, the #56 Tolman McLaren of Joe Osborne and David Pattison took no part in FP2 and will miss qualifying later on Saturday as the team undertakes an engines change.